On a day largely devoted to remembering Margaret Thatcher, one of the 20th century's greatest conservatives, would it really have been too much for Morning Joe to have had on at least one conservative guest to discuss her legacy? Apparently, yes. Morning Joe's lineup of political guests today leaned 100% left: Jon Meacham, Al Hunt, Cokie Roberts, Sen. Tim Kaine, former Obama aides Robert Gibbs and Melody Barnes, Tony Blair, Zbigniew Brzezinski, Mayor Michael Nutter, Eugene Robinson, Maureen Orth and Joe Klein. Joe Scarborough sometimes like to boast in such circumstances that his presence more than counterbalances the liberal avalanche. But on the major political issue of the day, gun control, Scarborough was just one more voice among many ripping Republicans for their opposition to President Obama's proposals. More after the jump. This is so pathetic and predictable, you could almost set your watch to it. Last Friday saw two high-profile liberal pundits - one on Bloomberg News's Political Capital and the other on PBS's Inside Washington - repeating the story that Newt Gingrich divorced his first wife while she was being treated for cancer, without either of them noting that one of Gingrich's daughters - Jackie Gingrich Cushman - last May specifically disputed the account that her mother, who is still alive, ever had cancer, or that her father initiated the divorce during a hospital visit. Jonathan Alter, who spent 28 years at Newsweek, has been a columnist at Bloomberg News since early this year. Just this year, the reliably and insufferably liberal Alter, among many other things, called the Republican House's passage of Paul Ryan's budget plan in April an attempt "to throw Granny in the snow," and coldly calculated that in the wake of her shooting, Arizona Congresswoman Gabrielle Giffords was more valuable to Barack Obama's reelection efforts alive than dead. It looks like someone in the establishment business press might be getting a little touchy about the razzing they continually receive for delivering "unexpectedly" bad economic news. As captured by Glenn Reynolds at Instapundit and corroborated in this Google News description, Bloomberg's 10:16 a.m. report on consumer sentiment told readers that "Consumer confidence unexpectedly fell in June to a seven-month low, indicating that slowing employment gains are weighing on Americans' outlooks." 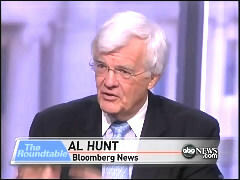 On Friday’s Political Capital show on Bloomberg News, as host Al Hunt turned the discussion to Newt Gingrich’s presidential campaign, Bloomberg’s Margaret Carlson attacked Republican Congressman Paul Ryan’s plan for Medicare reform as she voiced supposed agreement with Gingrich that "it is right-wing social engineering to destroy Medicare as we know it." She then went on to suggest that Gingrich plays "skinhead politics." 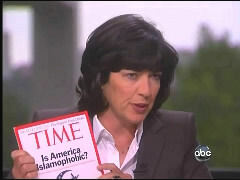 On Friday’s Political Capital, Bloomberg’s Margaret Carlson – formerly of CNN and Time magazine – left the impression that FNC coverage of the Shirley Sherrod video was partially responsible for her firing, prompting the National Review’s Kate O’Beirne to clarify that FNC did not show the video until after the USDA employee’s resignation. After host Al Hunt asked, "did it also say something bad about the so-called right-wing echo chamber or Fox News?" Carlson responded: "Well, once the tape was on Bill O'Reilly and Sean Hammity, Hannity, it got out there, and, you know, I was shown it on live TV, and I was snookered as the NAACP said they were." After also faulting the NAACP and the Obama administration for acting too quickly, she branded Sherrod a "hero" and "the model of the civil servant." O’Beirne then informed viewers: "Margaret, let the record show the videos didn’t appear on Fox News till she’d already been fired, so it’s sort of hard to blame them for the incredible overreaction." “The side that talks about the need to rein in the federal government” is “not very rational,” yet “is winning” the debate over whether to pass another “stimulus” bill, Al Hunt regretted on Sunday’s This Week on ABC.